I have an affinity for maps of nonexistent places. 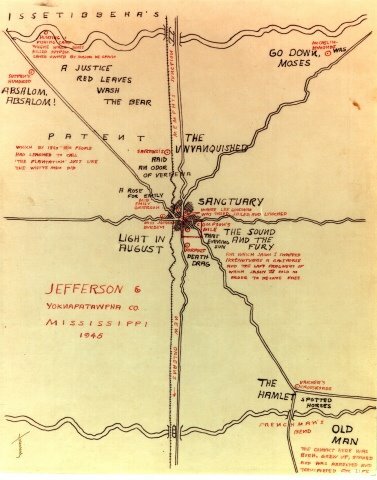 I'll admit up front that one of the things that drew me to William Faulkner's novels is that they took place in Yoknapatawpha County in Mississippi. In fact, there is even a map. You can trace your finger along the roads and rivulets of this phantom county, seeing where the Bundren family lived in As I Lay Dying (1930), or where Joe Christmas committed a murder in Light in August (1932). The fact that these events take place, that these characters stalk locations that are suspended somewhere between fact and reality perhaps give the novels added dramatic quality. But Faulkner's imaginaty geographies are not limited to Mississippi. Pylon (1935) may very well be his most flawed novel -- a tale of veteran war pilots who test their skills in air races, often dying at the throes of a dangerous new technology in a town called New Valois. In reading the decadent, sometimes violent passages describing New Valois, one wonders if this is really Faulkner's own private New Orleans. ... since the New England state of New Hampshire echoes the English county of Hampshire, and New York the English city and county of York, since American names in fact were frequently duplicated "across the ha-ha of a doubled ocean" (18.01), Nabokov invents the state of New Cheshire, in honor of the English county of Cheshire but perhaps also, with a grin at Lewis Carroll's Cheshire Cat, in honor of New York's Catskill Mountains (cf. Appel, Ada 167). There is also a Cheshire County in New Hampshire, less than fifteen miles from West Wardsboro, Vermont, where Nabokov spent two summers (1940 and 1942). Estotiland was a name given by early explorers to the northeastern part of North America, now northeast Labrador. Old mapmakers let it stretch as far north as their conjectured coastline ventured. Cf. John Milton, Paradise Lost, X.686: "From cold Estotiland." "Estotiland" is listed, along with Eden and Arcadia, under the heading "utopia, paradise, heaven, heaven on earth" in Roget's International Thesaurus (New York: Crowell, 1962). "'Russian' Estoty" may contain an echo of "Russian" Estonia. The idea that a novel has a specific geography is alluring. But when the geography is conjured, fantastic, or rooted in the esoteric or weird -- that is truly inspiring. Glowlab has just posted about Andrew Hussey's Paris: A Secret History--very keen to see what's inside. Perhaps more fictions, non-fictions, and maps that bridge both.